According to Google, progressive web apps are the next big thing for “delivering amazing user experiences on the web”. In the same vein as AMP (accelerated mobile pages), PWAs are causing digital marketers to rethink the way they can design and deliver their sites in a mobile-first world. Website owners and designers need to be paying attention. So just what is a progressive web app? It’s an all-in-one solution for web developers to create a single version website/app that can be delivered across all devices and works like an app but without the hassle of distribution through an app store. 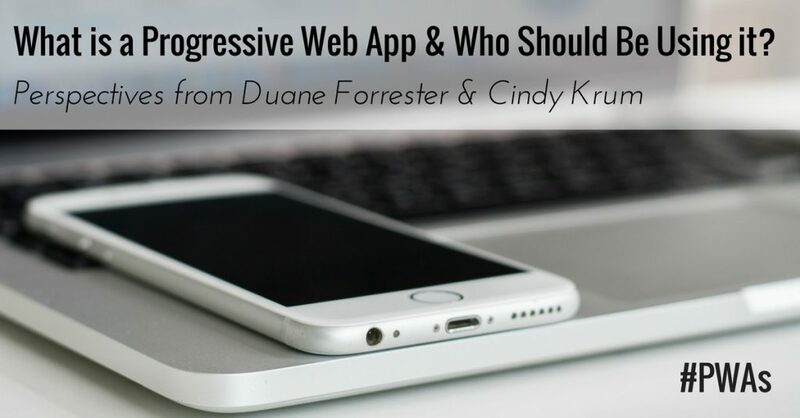 A progressive web app, or PWA, combines the best of a website and the best of a native application. It’s a type of hybrid app. If a user comes to your PWA-run site, they’ll get the mobile version of your site but faster. With a traditional hybrid app, like the Amazon app, the user’s interactions with it are built into the phone as an app, but the data collected is from the web. Here’s where a PWA is different. A PWA launches a browser to do the same thing. With the introduction of service workers (the scripts running in the background of your browser) and other technological advancements, browsers are more sophisticated than ever. They can do things on your phone that previously could only be done through a native app. This means you don’t have to publish the app in the app store. The barrier to entry of downloading an app is no longer an issue for your users. As a developer, you no longer have to program different apps for different devices, nor deal with special screen sizes. You can invest your time and resources into designing a PWA. If you have to make a mobile website, you might as well just use a PWA. It’s well worth it. Lots of big companies are already testing PWA code and integrations on their sites. Lyft, Mic, Washington Post, Flipboard, The Weather Channel and more have already launched beta PWA sites for testing. Google has already published some PWA development guidelines for SEO, but I think the update may depend on how aggressively Google and other influential companies promote PWAs. Google has also been hinting at cross-over between AMP and PWAs, using AMP to make PWA’s work in Safari, so there may be some new iteration of AMP that makes AMP enabled content available in PWA format. The PWA news viewer already behaves a lot like a PWA. My guess is that in the next year, we will see some of the more agile and cutting edge companies take their PWAs out of beta, and making them their main sites, with or without the influence of AMP. It will be interesting to watch more widespread adoption of PWAs unfold. As with anything new, of course, it can sometimes be hard to get clients to adopt bleeding edge technology. Here’s how Cindy is getting her clients on board. Cindy: The main recommendation is to try it out. You can add a service worker and an app manifest to any existing website. It is not enough to get the full benefits of a PWA, but it is enough to learn how easy or difficult the integration will be for your company. In our case, we developed an app manifest in five minutes, and a service worker in 90 minutes. Making web-apps indexable tends to be the harder part of the equation, but that is true with or without the PWA elements. Web apps are hard to index because developers don’t always include URLs for state-changes in the web app. For the immediate future, PWAs are something to be aware of, and if you’re able to, start working into your testing and planning cycles. There are no guarantees it’ll be the go-forward structure and remain supported by Google forever, but you don’t want to be left behind. There are practical upsides to PWAs that are worth considering regardless of how long it takes this to be a mainstream approach. This is something that Google was hinting at back in 2015 and being that I am not a Developer it made little sense back then. This article leads us to believe that there would be considerable benefits, can anyone provide a working example to showcase this hybrid platform?